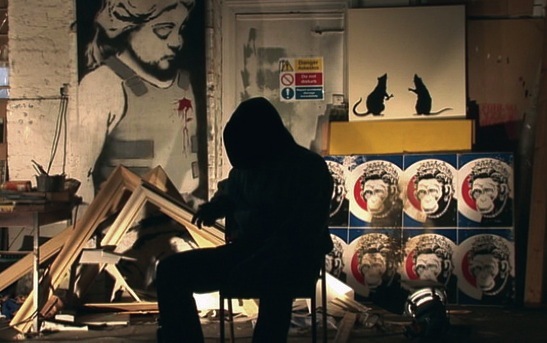 Banksy’s film tells the story of Thierry Guetta, an immigrant in Los Angeles from France, who started filming graffiti artists, and with a push from Banksy emerged as an artist. I went into this film without any preconceived notions, I didn’t really know what to expect, hell, I thought it was a documentary on Banksy. The film was funny and interesting, and an absolutely fabulous watch. The story of all these graffiti artists who Guetta trailed with his camera, and his quest to finally meet the shy Banksy is intriguing, but it’s not until the last half hour of the film, where Guetta decides to become an artist himself, does it get really interesting. Guetta’s Warholesque art is boring, and uninspired, but draws attention, because he knew how to work the media to his will.